What is scent to you? Eversince maturity struck...about 3 months ago...(haha, just kidding). For real now...scent has always been important to me. Eversince I started caring about my appearance and personal grooming, it was very important to me to have a "signature scent". Now that I have my own place, I extend that same philosophy towards my household. Why is scent so important to me? It came to me one day while we were strolling in a new mall...all of a sudden, me and Dennis exchanged looks and said..."smells so good, reminds me of Hong Kong". This is common knowledge...I've always known it but it was only at that momen that I truly internalized and paid mind to it...of all the senses, scent has the strongest ability to bring back nostalgie and memories. Aside from that, scent also has the ability to transform a space and create a unique atmosphere. Imagine a spa without the strong menthol smell or a hotel room without that clean, citrusy scent? Would you still pay the same price? I highly doubt it. The samples came in a wicker basket complete with candles, bath and body products, tea, candles, and even a cd with pre-recorded relaxing music. It had everything I needed to emulate a "spa ambiance" in my bathroom. A long, relaxing bubble bath was in place. Something I desperately needed after watching 2 rock concerts in a week. My body definitely took a beating. The warm water around my body, the soft flicker of the candle and the relaxing scent of lavender from Glade Sensations definitely did the trick. I feel rejuvenated. It's a wonder how slight changes in your daily routine can transform mundane tasks like taking showers into a healing experience. Not only that, leaving a packet of Glade sensations beside my towels also lent them a beautiful smell. Wanting to extend my zen experience in the bathroom, I stuck the Jasmine scented packet next to our airconditioner. Within minutes, our bedroom started smelling like a hotel room. Time to turn down the lights and continue the quest for total relaxation. Aside from its ability to create a zen atmosphere, Glade Sensations also works great in masking odors. The strongest of the bunch, the Lemon Scented Glade Sensations pack works best in the Kitchen. I use it to get rid of the stinky smell that fried fish leaves in our home. Glade Sensations also works great in removing tobacco smells. A big problem of ours, especially when we have friends over the previous night. Rather than have people recall the scent of our home as an oversized ashtray with doors, I'd prefer them to leave with the lingering scent of the ocean under their noses. 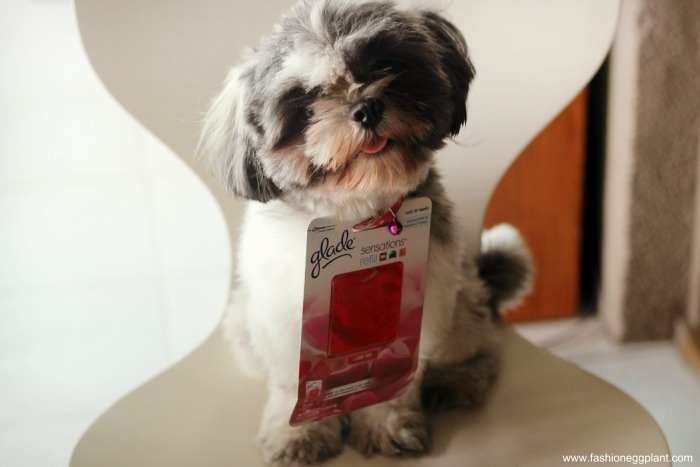 And lastly, Glade Sensations also works great in getting rid of that distinctive "doggy smell"! No matter how clean we keep our pets, they have a natural musk that they continously excrete. As much as we love our pets, I don't think we appreciate their smell as much. Now you can have the best of both worlds, a fluffy buddy and a non-fluffy buddy smelling home. The reason why I love Glade Sensations so much is because I find it more cost effective than other means of perfuming my home. Candles cost a lot and their scent doesn't stay on very long. For that, you will need to buy a special glass case to contain its smell. Room sprays are great, but then again, they tend to be pricey plus we go through the bottles very quickly. And having a pet and child at home, incense are definitely not an option for us. Glade Sensations are safe. They smell great and a single packet can last as long as 2 months. At just P80/ refill pack and P108* for a packet with the dispenser, it is definitely the better choice for me. ps. It also works great as a car freshener!